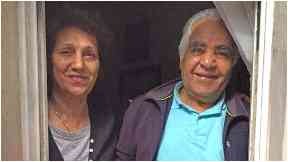 Mozaffar Saberi and Rezvan Habibimarand have lived in Edinburgh for over 40 years. Thousands of people have signed a petition against the removal of an Iranian couple whose family all live in the UK. Mozaffar Saberi, 83, and Rezvan Habibimarand, 73, bought a flat in Edinburgh in the late 1970s and have four children, 11 grandchildren and a great-grandchild who are all British citizens. A second application was also refused and they are now appealing against the decision, with the case due to be heard on February 25. The couple are distressed at the prospect of being separated from their family who all live in Edinburgh. Their son Navid Saberi said: "It is very very stressful. They are elderly and not really keeping well and on top of their health problems it is a psychological effect, not knowing what is around the corner and what is going to happen in the future. "The prospect of leaving three generations of children, grandchildren and a great-grandchild and going back to Iran has not been easy for them." He added: "They have got nobody in Iran. It is just beyond belief." John Vassiliou, partner at McGill & Co which is handling the case, said: "Mr Saberi is in his 80s, his wife is in her 70s. If they go back to Iran it's difficult for British citizens to visit Iran, they can't just fly over as if they were going to Spain or France. "They are showing lots of signs of old age physically and mentally and they just want to be with their family. If they go back to Iran they will be alone. "If they go back to Iran they will be two old people living alone whereas here they are living in Edinburgh with all their family around them." He added: "Their family are all here and that social aspect and emotional support that they get here will disappear if they go back to Iran." More than 3,000 people have signed a petition on change.org calling on the Home Office to allow the couple to stay in the UK. Ian Murray, Labour MP for Edinburgh South, has voiced his support for the family. He tweeted: "I'm working with the family & their lawyers to try & persuade the Home Secretary to do the decent thing." A Home Office spokesman said: "All UK visa applications are considered on their individual merits, on the basis of the evidence available and in line with UK immigration rules."